Reinforced in multiple high abrasion zones for toughness; including front internal pocket bags, back hip pockets and ruler and cargo pockets. Triple stitched inleg, front and back crotch seams to prevent tearing. Knees reinforced with Cordura for extra protection from stress when kneeling. 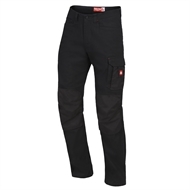 Wearer's left pocket features bellowed cargo pocket with smart phone pocket secured with tab, plus tool pocket.